I believe that the next generation is of Cryptocurrency as they are easily transportable, little to zero transaction fees, no human intervention between payor and payee, high anonymity, and even functionality. Money evolves, like anything else, and the natural evolution of money is always as a store of value that is easier to move, more secure, and more private. Bitcoin Cash is the brand-new entrant in digital currency. It was created on August 1, 2017 through a "hard fork." I.e. by the splitting of the bitcoin blockchain. A hard fork is when a digital currency splits into two separate currencies. 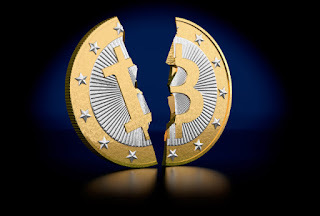 In this case, the original bitcoin split into bitcoin cash as a means of dealing with disagreements in the community over how the technology behind the currency should run. Everyone who held bitcoin before the split was entitled to the same number of "bitcoin cash" tokens, effectively receiving a free dividend. The blockchain split is the culmination of a long-term scaling debate within the digital currency community. Before the split, only 1 megabyte of transactions could be processed at any one time, which led to delays. Thus literally Bitcoin will be basically unaffected by the creation of the new cryptocurrency. Who exactly was given access to Bitcoin Cash? How can we obtain it?? These are the questions arise in many minds when heard of the blockchain split. As of August 1, holders of bitcoin who either controlled their private keys or had accounts with exchanges that were supporting Bitcoin Cash should have had access to an equal amount of cryptocurrency on both the bitcoin blockchain and the newly created Bitcoin Cash blockchain. Eventhough there exists some open source and noncustodial bitcoin wallet platforms such as Breadwallet that have provided users with an easy method of obtaining Bitcoin Cash, holders of bitcoin on non-custodial platforms usually need to undergo a manual process and use their private keys to be credited with Bitcoin Cash. Since Bitcoin Cash has yet to articulate its unique value proposition in a clear and well-defined manner its not safe. So I think its good to wait until the Bitcoin Cash market stabilizes as now there exists no legitimate and secure Bitcoin Cash wallet. I.e. when Bitcoin Cash is withdrawn from a wallet or an exchange, there is no alternative Bitcoin Cash wallet that users can utilize apart from exchanges that support Bitcoin Cash trading to store Bitcoin Cash. Thus like many things in the cryptocurrency space, that answer is unclear and it may take a year to get clear. One of the big problems faced by "bitcoin cash" is a lack of support from the mining community. Miners are needed to verify transaction on the bitcoin blockchain and this requires a large amount of computing power. The process is meant to take roughly 10 minutes, but the less power that is available, the longer the process takes. After the blockchain split, it took more than 5 hours for the first block of "bitcoin cash" transactions to be mined. This indicates that only a small number of miners are working on the new token. So far, only 12 blocks of transactions have been mined. The last block was around 10 hours ago, at the time of writing, according to data website Blockdozer Explorer. So far, only one of these blocks has taken advantage of the larger transaction limit offered by "bitcoin cash." Bitcoin Cash is an attempt to solve processing issues by allowing blocks to be processed in 8-megabyte units, rather than the one-megabyte block the older version of bitcoin uses. Because Bitcoin Cash is supported by a minority of developers and industry specialists, its future is uncertain and it will likely be prone to volatility. I think the fork is a healthy process because it's similar to how evolution works in nature and will help in adapting itself to changes.